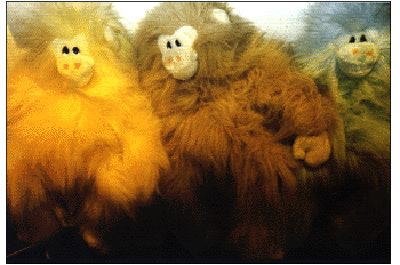 One day artists John Armleder, Olivier Mosset and Sylvie Fleury passed a shopping window in which three cuddly toy monkeys were put on display. Through this they looked at themselves suddenly as three monkeys forming the AMF artists having regularly shows together. So they took a picture of which later this screen print was made. AMF is a word play of the artists surnames and a company named AMF / American Machine and Foundry that merged in 1969 with Harley Davidson Company. Its logo AMF refers also to one of the AMF artists Olivier Mosset, an enthousiastic Harley Davidson motorcyclist.